TORONTO, Oct. 10, 2018 /CNW/ – Laramide Resources Ltd. ("Laramide" or the "Company") is pleased to announce it has engaged Roscoe Postle Associates Inc. ("RPA") in Denver, USA to prepare an independent NI 43-101 Technical Report on the mineral resources for the Company’s Crownpoint Uranium Properties (the Properties), located in New Mexico, United States (the "Resource Estimate"). The work is intended to address the resource estimation with respect to planned In Situ Recovery (ISR) of uranium. Further, the Resource Estimate will consolidate previously prepared resource estimates on the Properties and, more importantly, the significant work completed by previous operators on these properties which are considered "historical estimates" for purposes of NI 43-101 and, therefore, cannot be considered current mineral resources. The Company is working toward completion of the Resource Estimate in the fourth quarter of 2018. 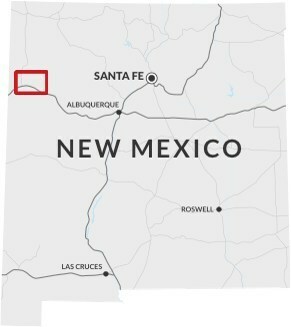 The Crownpoint Uranium Properties, 100% owned by Laramide, are located approximately 30 miles east of Laramide’s Churchrock Uranium Project (Figure 1). Crownpoint (and Churchrock Section 8 and 17) is covered by a licence from the United States Nuclear Regulatory Commission for production of uranium, which includes the construction of a Central Processing Plant at Crownpoint. The Central Processing Plant has an approved production capacity of 3 million pounds U3O8 per annum. The technical information in this news release has been prepared in accordance with the Canadian regulatory requirements set out in NI 43-101. The information has been reviewed and approved by Bryn Jones, MMinEng, FAusIMM, a Qualified Person under the definition established by National Instrument 43-101 and JORC. Mr. Jones is the Chief Operating Officer of the Company and a Fellow of the Australasian Institute of Mining and Metallurgy. To learn more about Laramide, please visit the Company’s website at www.laramide.com. Laramide Resources Ltd., headquartered in Toronto and listed on the TSX: LAM and ASX: LAM, is engaged in the exploration and development of high-quality uranium assets. Laramide’s portfolio of advanced uranium projects have been chosen for their production potential. 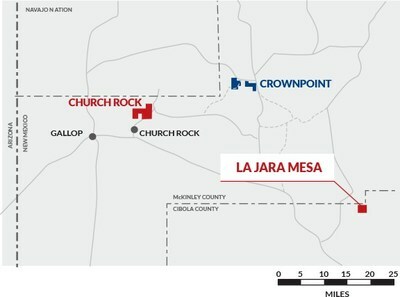 Major U.S. assets include the Churchrock and Crownpoint In Situ Recovery (ISR) projects and La Jara Mesa in Grants, New Mexico, as well as La Sal in the Lisbon Valley district of Utah. The recently acquired Churchrock and Crownpoint properties, with near-term development potential and significant mineral resources, form a leading ISR division operating in a tier one jurisdiction with enhanced overall project economics. The Company’s Australian advanced stage Westmoreland is one of the largest projects currently held by a junior mining company. This News Release contains forward looking statements which are subject to a variety of risks and uncertainties which could cause actual events or results to differ materially from those reflected in the forward looking statements. The Company does not intend to update this information and disclaims any legal liability to the contrary.